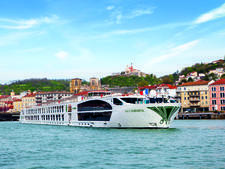 From its start more than 30 years ago, Uniworld, a global river cruising line, has continuously expanded both its fleet and the scope of its efforts, operating more than 500 departures annually and covering more than 20 countries. Its cruises range in length from a week to a month and are designed to appeal to a wide variety of interests and passengers. Along with its primary operations in Western and Central Europe, the company works in partnership with groups in Portugal, Egypt, Vietnam, India and China to bring the Uniworld experience to other parts of the globe. The company was founded in 1976 by Serbian-born Serba Ilich, who'd served as an executive with KLM Royal Dutch Airlines. 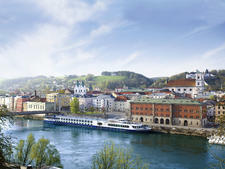 While there were other river cruise lines out there, most focused on passengers from Europe. Ilich's approach was different: He targeted his line to meet the needs and preferences of North American travelers by hiring English-speaking staff and creating dining options more in line with American tastes. In 2004, control of the company was sold to Travel Corporation, a Bermuda-based organization with varied travel interests (Contiki Holidays, Trafalgar Tours, Insight Vacations, etc.). This company -- which also operates deluxe hotels that are part of Red Carnation (including London's Chesterfield Mayfair and Rubens at the Palace, Palm Beach's Chesterfield and Dorset's Summer Lodge) -- has transformed the onboard ambience of all the river ships it acquired. New ones have a decidedly more upscale feel about them. From its Los Angeles headquarters, the company remains in touch with its worldwide operations, and it has opened subsidiary offices across Europe and in Egypt. Uniworld also maintains a close relationship with its large repeat clientele through the River Heritage Club, a loyalty program that acts as a sounding board for the company for possible changes and requests. It's worth noting that in the UK Titan is the exclusive partner for Uniworld (in other words, Uniworld is only bookable through Titan), with a dedicated brochure featuring all cruises, flights and Titan's VIP Home Departure Service. The 159-passenger S.S. Catherine is elegant, comfortable, colorful and whimsical, with some some staterooms having both private balconies and French verandahs. 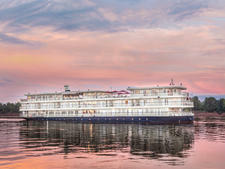 Uniworld's chartered vessel on the Mekong carries 68 passengers and has a high crew-to-passenger ratio. River Princess' ambiance is different from that of sister ship River Empress, with starker and bolder decor, honey-colored woods, aluminum accents and a jewel-toned palette. Uniworld's River Queen, launched in 1999, set the standard for the company's new-builds; it's the first to boast an elevator and launderette. Uniworld's Joie de Vivre lives up to its name, bringing together the joys of life: fabulous food, wine, music, art, design and travel with family and friends. 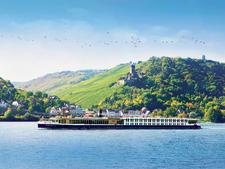 On all vessels, whether refurbished or newly built, Uniworld's signature is a daring, dynamic and colorful ambience. Public rooms and cabins are furnished in a high standard, with lush fabrics, antiques and original artwork nestled next to state-of-the-art necessities like flat-screen televisions, plush bathrooms and incredibly comfortable Savoir brand beds. Cuisine and service are on a par with oceangoing luxury vessels (though, as river boats are significantly smaller, options like alternative restaurants and entertainment venues are typically fewer in number). Uniworld has moved toward all-inclusive, and most cruise fares (excluding Russia, India, China and Vietnam) include unlimited fine wine, beer and spirits, as well as gratuities for onboard and onshore services, such as pre- and post-cruise extensions. Most shore tours are included in ticket prices, and a handful of extra options, such as a bicycling and wine tasting tour in the Danube's Durnstein, are available for a fee. Each ship carries a fleet of bicycles for free use by passengers. While "big ship" entertainment options -- think Broadway-style production shows and casinos -- are not offered, each evening provides diversions that range from local acts who come onboard in ports of call to bands that play for dancing. Uniworld continues to proffer an experience geared primarily to North Americans, but it's also marketing to English-speaking travelers in the U.K. and Australia. 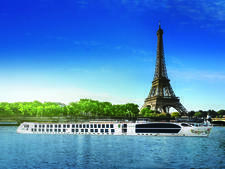 Consistent with the traditional European river cruising dynamic, its voyages tend to appeal to more senior passengers, but its onboard ambience also attracts younger cruisers, especially in the 40-and-older market. The company also markets a handful of multigenerational themed family cruises each year. Uniworld's fleet consists of 19 ships (including charters). Since acquiring Uniworld in 2004, Travel Corporation has aggressively embarked on a refurbishment program for existing vessels and acquired new ones. One of its most spectacular vessels -- and the first to be built from scratch -- is innovative S.S. Antoinette. The 164-passenger ship features cabins and suites with alcove conservatories that, at the touch of a button, transform into open-air balconies. Plus, marble bathrooms are standard in all cabins. Equally splendid is the even newer S. S. Maria Theresa, which carries 150 passengers. Others in this class of "Super Ships" include S.S. Catherine and S.S. Beatrice. The company charters numerous boats for use on the rivers of Russia, Egypt, Portugal, China, India, Vietnam and Cambodia. For example, the line markets and sells Yangtze River cruise-tours, which combine water-based portions on boats owned by Century Cruises with land-based touring.